Warning: This blog post is getting a bit old. If you are looking to learn more about implementing push, check out our Web Push Notifications documentation. Push notifications allow your users to opt-in to timely updates from sites they love and allow you to effectively re-engage them with customized, engaging content. As of Chrome version 42, the Push API and Notification API are available to developers. The Push API in Chrome relies on a few different pieces of technology, including Web App Manifests and Service Workers. In this post we'll look at each of these technologies, but only the bare minimum to get push messaging up and running. To get a better understanding of some of the other features of manifests and the offline capabilities of service workers, please check out the links above. We will also look at what will be added to the API in future versions of Chrome, and finally we'll have an FAQ. This section describes each step you need to complete in order to support push messaging in your web app. There is a dependency of having a service worker to implement push messages for the web. The reason for this is that when a push message is received, the browser can start up a service worker, which runs in the background without a page being open, and dispatch an event so that you can decide how to handle that push message. Below is an example of how you register a service worker in your web app. When the registration has completed successfully we call initialiseState(), which we'll cover shortly. // enhance and add push messaging support, otherwise continue without it. The button click handler subscribes or unsubscribes the user to push messages. isPushEnabled is a global variable which simply tracks whether push messaging is currently subscribed or not. These will be referenced throughout the code snippets. Once the service worker is registered, we need to set up our UI's state. Users will expect a simple UI to enable or disable push messages for your site, and they'll expect it to keep up to date with any changes that occur. In other words, if they enable push messages for your site, leave and come back a week later, your UI should highlight that push messages are already enabled. You can find some UX guidelines in this doc, in this article we'll be focusing on the technical aspects. At this point you may be thinking there are only two states to deal with, enabled or disabled. There are however some other states surrounding notifications which you need to take into account. There are a number of APIs we need to check before we enable our button, and if everything is supported, we can enable our UI and set the initial state to indicate whether push messaging is subscribed or not. With this initial state, we can perform the checks outlined above in the initialiseState() method, i.e. after our service worker is registered. // Are Notifications supported in the service worker? // Check the current Notification permission. We check that showNotification is available in the ServiceWorkerRegistration prototype. Without it we won't be able to show a notification from our service worker when a push message is received. We check what the current Notification.permission is to ensure it's not "denied". A denied permission means that you can't show notifications until the user manually changes the permission in the browser. To check if push messaging is supported we check that PushManager is available in the window object. Finally, we used pushManager.getSubscription() to check whether we already have a subscription or not. If we do, we send the subscription details to our server to ensure we have the right information and set our UI to indicate that push messaging is already enabled or not. We'll look at what details exist in the subscription object later in this article. We wait until navigator.serviceWorker.ready is resolved to check for a subscription and to enable the push button because it's only after the service worker is active that you can actually subscribe to push messages. 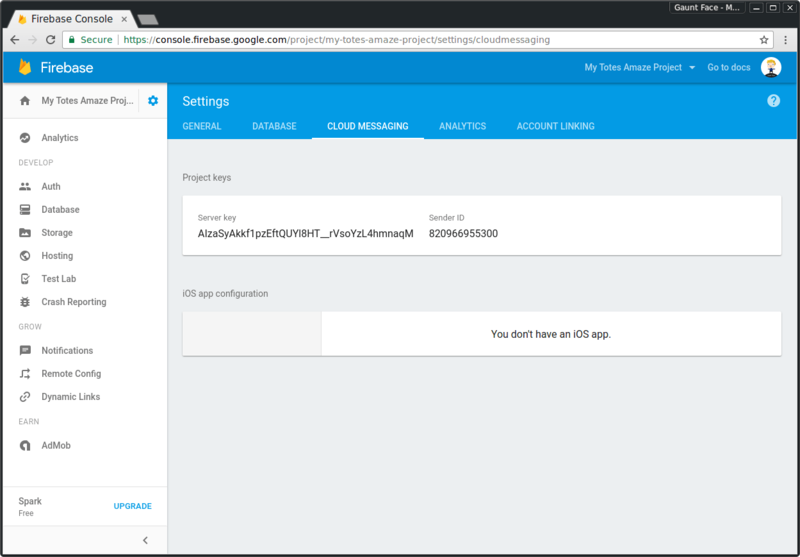 The next step is to handle when the user wants to enable push messages, but before we can do this, we need to set up a Google Developer Console project and add some parameters to our manifest to use Firebase Cloud Messaging (FCM), formerly known as Google Cloud Messaging (GCM). 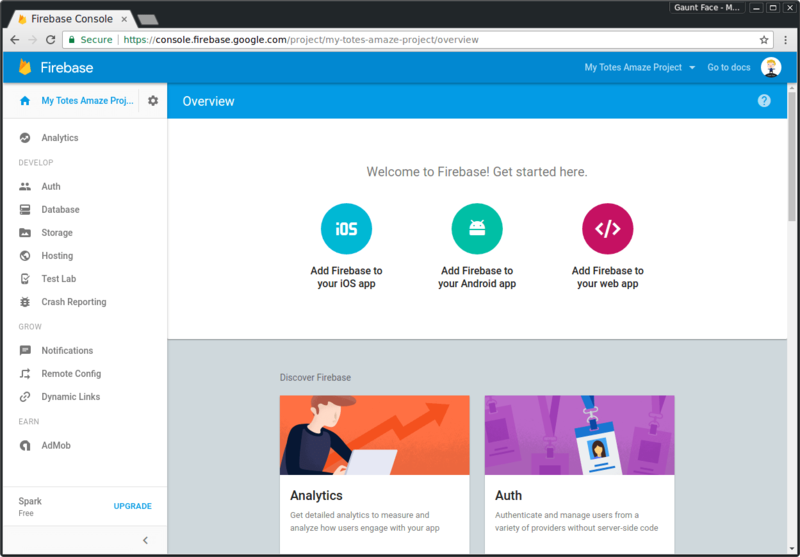 Chrome uses FCM to handle the sending and delivery of push messages; however, to use the FCM API, you need to set up a project on the Firebase Developer Console. The following steps are specific to Chrome, Opera for Android and Samsung Browser they use FCM. We'll discuss how this would work in other browsers later on in the article. 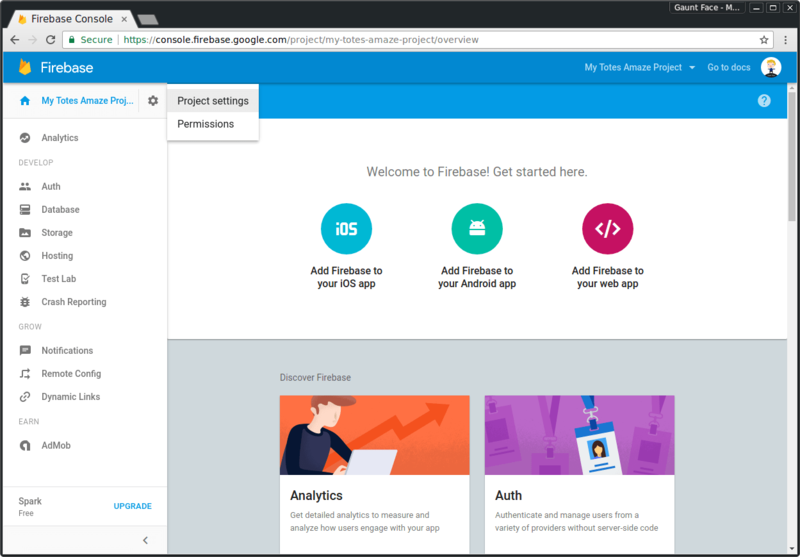 To start off with you need to create a new project on https://console.firebase.google.com/ by clicking on the 'Create New Project'. From this dashboard, click the cog next to your project name in the top left corner and click 'Project Settings'. In the settings page, click the 'Cloud Messaging' tab. This page contains the API key for push messaging, which we'll use later on, and the sender ID which we need to put in the web app manifest in the next section. For push, we need to add a manifest file with a gcm_sender_id field, to get the push subscription to succeed. This parameter is only required by Chrome, Opera for Android and Samsung Browser so that they can use FCM / GCM. The gcm_sender_id is used by these browsers when it subscribes a users device with FCM. This means that FCM can identify the user's device and make sure your sender ID matches the corresponding API key and that the user has permitted your server to send them push messages. "gcm_sender_id": "<Your Sender ID Here>"
You'll need to set the gcm_sender_id value to the sender ID from your Firebase Project. Once you have saved your manifest file in your project (manifest.json is a good name), reference it from your HTML with the following tag in the head of your page. If you don't add a web manifest with these parameters you'll get an exception when you attempt to subscribe the user to push messages, with the error "Registration failed - no sender id provided" or "Registration failed - permission denied". To subscribe, you have to call the subscribe() method on the PushManager object, which you access through the ServiceWorkerRegistration. This will ask the user to give your origin permission to send push notifications. Without this permission, you will not be able to successfully subscribe. If the promise returned by the subscribe() method resolves, you'll be given a PushSubscription object which will contain an endpoint. The endpoint should be saved on your server for each user, since you'll need them to send push messages at a later date. // gcm_user_visible_only in the manifest. At this point your web app is ready to receive a push message, although nothing will happen until we add a push event listener to our service worker file. When a push message is received (we'll talk about how to actually send a push message in the next section), a push event will be dispatched in your service worker, at which point you'll need to display a notification. This code registers a push event listener and displays a notification with a predefined title, body text, icon and a notification tag. One subtlety to highlight with this example is the event.waitUntil() method. This method takes in a promise and extends the lifetime of an event handler (or can be thought of as keeping the service worker alive), until the promise is settled; In this case, the promise passed to event.waitUntil is the returned Promise from showNotification(). The notification tag acts as an identifier for unique notifications. If we sent two push messages to the same endpoint, with a short delay between them, and display notifications with the same tag, the browser will display the first notification and replace it with the second notification when the push message is received. If you want to show multiple notifications at once then use a different tag, or no tag at all. We'll look at a more complete example of showing a notification later on in this post. For now, let's keep things simple and see if sending a push message shows this notification. We've subscribed to push messages and our service worker is ready to show a notification, so it's time to send a push message through FCM. This is only applicable to the browsers using FCM. When you send the PushSubscription.endpoint variable to your server, the endpoint for FCM is special. It has a parameter on the end of the URL which is a registration\_id. This is specific to browsers using FCM. In a normal browser you would simply get an endpoint and you would call that endpoint in a standard way and it would work regardless of the URL. Once you've got the registration ID, you can make a call to the FCM API. You can find reference docs on the FCM API here. An Authorization header with a value of key=<YOUR_API_KEY> must be set when you call the API, where <YOUR_API_KEY> is the API key from Firebase project. The API key is used by FCM to find the appropriate sender ID, ensure the user has given permission for your project and finally ensuring that the server's IP address is whitelisted for that project. An appropriate Content-Type header of application/json or application/x-www-form-urlencoded;charset=UTF-8 depending on whether you send the data as JSON or form data. An array of registration_ids - these are the registration ID's you'd extract from the endpoints from your users. Please do check out the docs about how to send push messages from your server, but for a quick sanity check of your service worker you can use cURL to send a push message to your browser. Swap out the <YOUR_API_KEY> and <YOUR_REGISTRATION_ID> in this cURL command with your own and run it from a terminal. When developing your backend logic, remember that the Authorization header and format of the POST body are specific to the FCM endpoint, so detect when the endpoint is for FCM and conditionally add the header and format the POST body. For other browsers (and hopefully Chrome in the future) you'll need to implement the Web Push Protocol. A downside to the current implementation of the Push API in Chrome is that you can't send any data with a push message. Nope, nothing. The reason for this is that in a future implementation, payload data will have to be encrypted on your server before it's sent to a push messaging endpoint. This way the endpoint, whatever push provider it is, will not be able to easily view the content of the push message. This also protects against other vulnerabilities like poor validation of HTTPS certificates and man-in-the-middle attacks between your server and the push provider. However, this encryption isn't supported yet, so in the meantime you'll need to perform a fetch to get information needed to populate a notification. The notification we've seen so far is pretty basic and as far as samples go, it's pretty poor at covering a real world use case. Realistically, most people will want to get some information from their server before displaying the notification. This may be data to populate the notification title and message with something specific, or going a step further and caching some pages or data so that when the user clicks on the notification, everything is immediately available when the browser is opened—even if the network isn't available at that time. In the following code we fetch some data from an API, convert the response to an object and use it to populate our notification. It's worth, once again, highlighting that the event.waitUntil() takes a promise which results in the promise returned by showNotification(), meaning that our event listener won't exit until the asynchronous fetch() call is complete, and the notification is shown. You'll notice that we show a notification even when there is an error. This is because if we don't, Chrome will show it's own generic notification. This example opens the browser to the root of the site's origin, by focusing an existing same-origin tab if one exists, and otherwise opening a new one. There's a post dedicated to some of the things you can do with the Notification API here. You've subscribed a user's device and they're receiving push messages, but how can you unsubscribe them? // subscription object, which you can call unsubscribe() on. Subscriptions may get out of sync between FCM and your server. Make sure your server parses the response body of the FCM API's send POST, looking for error:NotRegistered and canonical_id results, as explained in the FCM documentation. Subscriptions may also get out of sync between the service worker and your server. For example, after subscribing/unsubscribing successfully, a flaky network connection may prevent you from updating your server; or a user might revoke notifications permission, which triggers an automatic unsubscribe. Handle such cases by checking the result of serviceWorkerRegistration.pushManager.getSubscription() periodically (e.g. on page load) and synchronizing it with the server. You may also wish to re-subscribe automatically if you no longer have a subscription and Notification.permission == 'granted'. In sendSubscriptionToServer() you will need to consider how you handle failed network requests when updating the endpoint. One solution is to track the state of the endpoint in a cookie to determine whether your server needs the latest details or not. All of the above steps results in a full implementation of push messaging on the web in Chrome 46. There are still spec'd features that will make things easier (like a standard API for triggering push messages), but this release enables you to start building push messaging into your web apps today. While implementing push messages, bugs will live in one of two places: your page or your service worker. Go to chrome://inspect > Service workers. This view doesn't provide much information other than the currently running service workers. Go to chrome://serviceworker-internals and from here you can view the state of service workers, and see errors, if there are any. This page is temporary until DevTools has a similar feature set. Notice the "success": 1 response. If you see a failure instead, then that suggests that something isn't right with the FCM registration ID and the push message isn't getting sent to Chrome. At the moment debugging service workers on Chrome for Android is not obvious. You need to navigate to chrome://inspect, find your device and look for a list item with the name "Worker pid:...." which has the URL of your service worker. The Chrome team has been putting together a document of best practices for push notifications UX as well as a document covering some of the edge cases when working with push notifications. This section goes into a little bit of detail surrounding some of the Chrome specific parts of this implementation that you should be aware of and how it will differ from other browser implementations. The beauty of the Push API standard is that you should be able to take the endpoint, pass them to your server and send push messages by implementing the Web Push Protocol. The Web Push Protocol is a new standard which push providers can implement, allowing developers to not have to worry about who the push provider is. The idea is that this avoids the need to sign up for API keys and send specially formatted data, like you have to with FCM. Chrome was the first browser to implement the Push API and FCM does not support the Web Push Protocol, which is the reason why Chrome requires the gcm_sender_id and you need to use the restful API for FCM. The end goal for Chrome is to move towards using the Web Push Protocol with Chrome and FCM. Until then, you need to detect the endpoint "https://fcm.googleapis.com/fcm/send" and handle it separately from other endpoints, i.e. format the payload data in a specific way and add the Authorization key. How to Implement the Web Push Protocol? Firefox Nightly is currently working on push and will likely be the first browser to implement the Web Push Protocol. Can I prevent duplicate notifications if my web presence has multiple origins, or if I have both a web and native presence? There isn't a solution to this at the moment, but you can follow progress on Chromium. The ideal scenario would be to have some kind of ID for a users device and then on the server side match up the native app and web app subscription ID's and decide which one to send a push message to. You could do this via screen size, device model, sharing a generated key between the web app and native app, but each approach has pro's and con's. Why do I need a gcm_sender_id? 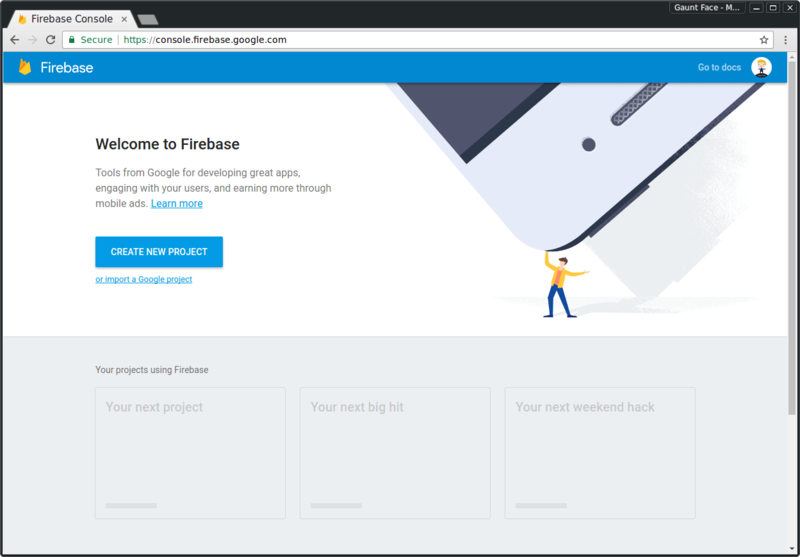 This is required so that Chrome, Opera for Android and the Samsung Browser can use the Firebase Cloud Messaging (FCM) API. The goal is to use the Web Push Protocol when the standard is finalized and FCM can support it. Why not use Web Sockets or Server-Sent Events (EventSource)? The advantage of using push messages is that even if your page is closed, your service worker will be woken up and be able to show a notification. Web Sockets and EventSource have their connection closed when the page or browser is closed. What if I don't need background event delivery? If you don't need background delivery then Web Sockets are a great option. When can I use push without showing notifications (i.e. silent background push)? There is no timeline for when this will be available yet, but there is an intent to implement background sync and while it's not decided or spec'd, there is some discussion of enabling silent push with background sync. Why does this require HTTPS? How do I work around this during development? Service workers require secure origins to ensure that the service worker script is from the intended origin and hasn't come about from a man-in-the-middle attack. Currently, that means using HTTPS on live sites, though localhost will work during development. What does browser support look like? Chrome supports in its stable version and Mozilla have push being worked on in Firefox Nightly. See the implementing the Push API bug for more info and you can track their Notification implementation here. Can I remove a notification after a certain time period? At the moment this isn't possible but we are planning on adding support to get a list of currently visible notifications. If you have a use case to set an expiration for notification after it's displayed created, we'd love to know what that is, so please add a comment and we'll pass it back to the Chrome team. If you only need to stop a push notification from being sent to the user after a certain time period, and don't care how long the notification stays visible, then you can use FCM's time to live (ttl) parameter, learn more here. What are the limitations of push messaging in Chrome? Chrome's usage of CCM as a push service creates a number of proprietary requirements. We're working together to see if some of these can be lifted in the future. You have to show a notification when you receive a push message. Chrome on desktop has the caveat that if Chrome isn't running, push messages won't be received. This differs from Chrome OS and Android where push messages will always be received. Shouldn't we be using the Permissions API? The Permission API is implemented in Chrome, but it's not necessarily going to be available in all browsers. You can learn more here. Why doesn't Chrome open up the previous tab when I click a notification? This issue only affects pages which aren't currently controlled by a service worker. You can learn more here. What if a notification is out of date by the time the users device received the push? You always have to show a notification when you receive a push message. In the scenario where you want to send a notification but it's only useful for a certain period time, you can use the 'time_to_live' parameter on CCM so that FCM won't send the push message if it passes the expiry time. What happens if I send 10 push messages but only want the device to receive one? FCM has a 'collapse_key' parameter you can use to tell FCM to replace any pending message which has the same 'collapse_key', with the new message.